My first acquaintance with Baybayin is through my father (John de los Santos) who taught me to read and write the script back in the early 1980's. I was in my teens back then and didn't know its significance, I just thought it was some cool form of shorthand. Later on in life, about a year or so after immigrating to the U.S. from the Philippines, I began soul searching and looking back into my heritage (maybe it was due to the fact that I was homesick). Thanks to the Internet and its vast resource of information, I eventually stumbled upon Paul Morrow's work on Baybayin. This sparked my renewed interest in the ancient script of my ancestors. I began incorporating the script into my projects such as artworks and even videogame development. Earlier this year, I started creating my own fonts based on my handwriting. I came up with a set of four true type fonts (TTF) I called "Baybayin Modern". The fonts are stylized modern composite of many examples from the past but the style is based primarily on my calligraphy work and handwriting. Though stylized, these fonts are still based on the basic strokes of historic samples of the Baybayin. The font is calligraphic & artistic representations and the characters’ shapes, sizes and weights have been made uniform in order to present a neat and elegant printed appearance. Besides style & dimensions, a couple of "new" features are introduced by my fonts; a major addition is the introduction of a character for the phonetic-syllable /ra/; since /da/ and /ra are originally represented by the same character ("DA") in the Filipino languages rendered by Baybayin (alternatively the "LA" character is sometimes used for /ra/ in borrowed foreign words rendered by Baybayin). 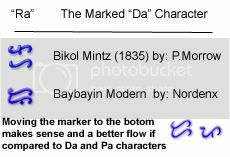 In my own handwriting, in order for me to recognize my /ra/ from my /da/, I add a marker to the "DA" character in order to differentiate the two. Coincidentally my "RA" character matches the features of the "PA" character therefore it seemingly creates a consistent flow not unlike the roman "P" and "R" letters. An instance of a separate character for "RA" can be found in Bikolano's version of the script. The Bikolanos have a unique way of writing Baybayin (Basahan) which includes a different way of writing the kudlits (kaholowan). Anyway, this is where some features of Baybayin Modern and my handwriting are based on (including kudlit orientation and of course the unique "RA" character). If you're a purist, just don't use the "R" key and use the "D" key instead. Additionally, just like Paul Murrow's fonts, the phonetic and phoneme equivalents of the roman letters Q, J, and X have their own unique character keystroke. They are not new characters (unlike the failed method of the erroneously named Alibata script by revisionists from the early 1900s), instead they are just keystroke shortcuts for typing the sequence of original script characters that represent the syllabic/phonetic equivalents of Q, J, and X in Filipino languages (Kwa, Dya, and Eks respectively). These file hosting sites would often purge files, if this happens and you can't download, please let me know via email (nordenx@gmail.com) and I'll re-upload the files. nordenx.deviantart.com - some of my Baybayin related artwork can be seen here, check out my gallery. kakaiba.com/n - prints and T-shirts that feature my Baybayin artwork are available here. http://www.anakbathala.com/ - an online multiplayer role playing game project (work in progress).